Consumer interest in wearable technology has been falling since a large holiday peak in January, but the introduction of new products continues to engross consumers. This month, consumers were impressed by Thalmic Labs’ Myo Gesture Controlled Armband, and while Best Buy continues to be the best wearables retailer, companies are increasingly shunning the typical retail experience in favor of a more directed relationship with their consumers. Argus Insights keeps track of the market to provide clients with the tools and insights they need to succeed, sign up here to receive this Wearables Demand Snapshot every month. 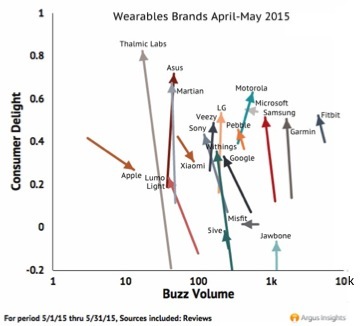 Consumer demand has been falling across the entire wearables market since a post holiday peak. Fitbit, Jawbone, Samsung, and Garmin continue to see the most of this waning attention, while Microsoft saw its short lived attention fall off in December. Despite the much anticipated release of the Apple Watch in late April, supply problems have prevented Apple from immediately dominating the market. Fitbit continues to hold the most mindshare in the Wearables market, but their lagging presence outside of fitness bands and the seemingly constant stream of several small brands throughout the market has contained their monopoly of the consumer’s minds. While brands like Misfit, Microsoft, and Pivotal Living saw short lived boosts in attention, Fitbit, Garmin, Samsung, and Jawbone see rather consistent streams of consumer feedback to lead mindshare in the market. The most popular wearables brands tended to see lower delight, while more niche brands are satisfying the few customers who provide them with feedback. Thalmic Labs impressed their users with the Myo Gesture Control Armband. Their product is only available to buy through their site or Amazon, and this exclusivity has created a directed relationship with consumers by shunning the traditional retail experience. Aside from the Myo Band, the other most delightful brands produced happy consumers with smartwatches, as the Asus Zen Watch, Martian Notifier, and Moto 360 all saw increasingly positive feedback. Microsoft was a top delighter last month, but their feedback remained rather consistent as other brands saw improvement to fly past their stagnant delight score. 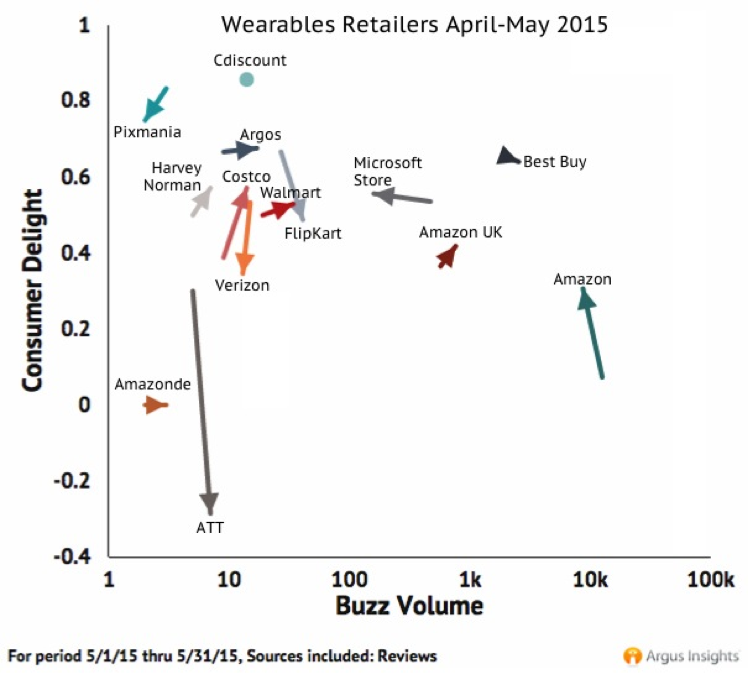 Amazon and Best Buy continue to be the most popular wearables retailers, as consumer shun the purchase process through carriers like ATT and Verizon. Though the feedback comes in low volumes, the few French consumers who reviewed their wearables through Cdiscount and Pixmania reported the highest satisfaction, followed by Argos consumers from the UK. Worsening perception of the Moto 360 greatly affected the delight of Indian consumers who reported decreased delight while at the same time demonstrating more interest. Overall, Best Buy maintains their position as the best wearables retailer, but other stores are better delighting consumers in lower volumes. Looking to the most discussed usage scenarios of Fitness Bands and Smartwatches, it is clear that wearables consumers remain highly concerned with battery life and the quality of the tiny little wrist worn screens. Applications are top of mind for fitness band users, who are primarily concerned with tracking their steps and calories. There is a clear difference in Smartwatch usage, as these users are most interested in, and fairly frustrated with, texting and alerting. Fitness Band and Smartwatch consumers do however agree on their love for accurate heartbeat monitors and mutual infatuation with apps, but manufacturers of all wearables should work to improve alerting functionality and battery life. Social media conversation demonstrates a persistent interest in Smartwatch news. People love to talk about the next new device, whether it be a WiFi enabled storage watch kick-starter, or a mood displaying social promoter, they are excited about the new possibilities. Aside from talk of the latest Smartwatch features, the potential of wearables in the medical space is also capturing attention. Consumer interest in the wearables market has been steadily dropping off, but the big dogs like Fitbit, Garmin, Samsung, and Jawbone still see a majority of the shrinking mindshare, while less popular brands are driving delight. Argus Insights tracks consumer perception across the entire wearables market to gain insight and coach our clients to develop better products and surpass their competition. Let us know how we can help your company.